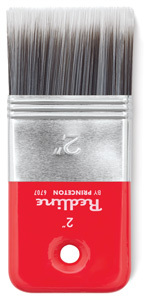 Princeton Redline Brushes are perfect for big tasks. Developed and handcrafted by Germany's most experienced brushmakers, every Redline brush features multiple synthetic filaments and hair lengths for holding more paint. The result is shorter and more efficient painting sessions while providing control and consistency on large surfaces. Redline handles are made from European beech, then coated with lacquer for durability. Flat Paddle — A short paddle brush that easily spreads paint, creates effects, and smudges and blends colors.